America’s third President, author of the Declaration of Independence and the first Secretary of State, lived during a time of inconceivable hardships, and he rose to the occasion unflinchingly. The Jefferson Memorial was built (and later, restored) to honor Thomas Jefferson’s service to the country. Work on the neoclassical building was begun in 1939 by contractor John McShain, working from designs by architect John Russell Pope. Although the building itself was completed in 1943, the bronze statue of the great man himself wasn’t installed until 1947. The Tidal Basin was once a popular swimming spot. Fill dredged from the Potomac River was used to create the solid ground on which the Jefferson Memorial stands today. But prior to that, the Tidal Basin had been a popular recreational spot for swimmers since the 1880s. In 1914, Congress approved a measure to create an official beach. Unfortunately, it was segregated, and black Americans were forced to swim at an area across the Tidal Basin that lacked facilities. About a decade later, swimming was banned at the Tidal Basin altogether. The Jefferson Memorial was almost a multipurpose memorial. 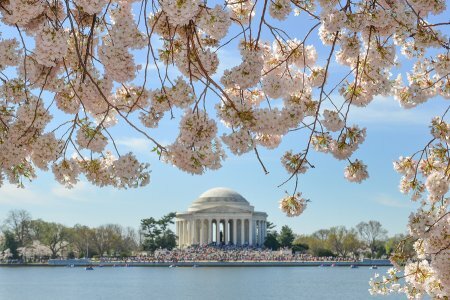 By the early 1900s, there was some talk about building a memorial on the Tidal Basin dedicated to various “ illustrious men of the nation .” It isn’t clear exactly which men would have been honored by this multipurpose memorial. But apparently, the idea didn’t have many supporters, and it never came to fruition. Area residents didn’t want the memorial at the Tidal Basin. Quite a few people were opposed to the proposed location of the Jefferson Memorial. Some didn’t like the idea that the memorial’s construction would require the removal of some beautiful, fully grown cherry and elm trees. Others simply thought that Jefferson had been too humble of a man to have a memorial located so near the White House. Scaffold Resource has had the privilege of working on many of America’s National Treasures, including the Jefferson Memorial. We invite area builders to browse our website to view our extensive portfolio of scaffolding and shoring system projects in Washington, D.C. and the surrounding areas. When you’re ready to plan your project, call our office at (301) 924-7223. Wire ropes are often used in scaffolding, and like the rest of your scaffold system, they require frequent inspections and maintenance to keep them in good condition. Using wire ropes that have deteriorated is dangerous to all workers on a job site. 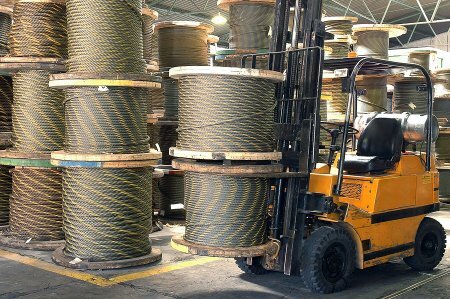 Wire ropes should be inspected every day for signs of rusting, corrosion, kinking, and abrasions, as well as signs of chemical, electricity, or heat exposure. If you’re using a sandblaster on the job site, look for signs of damage caused by it. You should also keep careful records of the inspections that note any signs of issues you see. This can help you track whether damage is getting worse. Any rope that has multiple areas of damage should be replaced. Scaffold Resource in Washington, D.C., offers both scaffold rentals and full support to help you use them safely. We’re here to answer your questions about getting the right scaffolding for your project and creating safe job sites. Call (301) 924-7223 to learn more. Excavations are part of many job sites, and shoring systems are often necessary to keep those working in excavated areas safe. Improper shoring can lead to collapse of the excavation area and put workers at risk. Watch this video to learn the basics of excavation, including methods for bracing the excavation zone. Shoring is one of the most reliable options, as long as the correct installation methods are used. At Scaffold Resource , we are committed to improving safety on job sites with our scaffolding and shoring rental in Washington, D.C. Our team can ensure that your excavation has the right kind of shoring to keep your team safe. You can learn more about our shoring rental and services by calling (301) 924-7223. 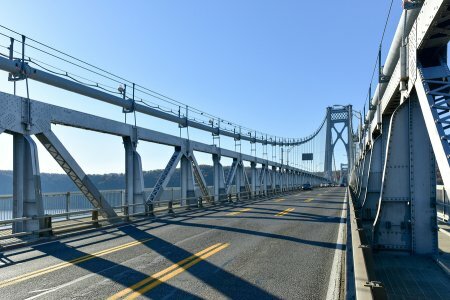 Scaffold Resource has been involved in construction and repairs of some of the most historic buildings and bridges across the country, such as renovations of the Mid-Hudson Bridge in Poughkeepsie, NY, an important artery that connects Ulster and Dutchess counties. The bridge was opened to the public in 1930 and became part of the New York State Bridge Authority in 1933. Here is a closer look at the history of the bridge and our involvement in its upkeep. In 1923, the approval to build the bridge was passed by the New York State Legislature with the idea of creating another roadway to cross the Hudson south of Albany besides the Bear Mountain Bridge. Design company Modjeski and Moran were tasked with creating the bridge design, while the New York State Department of Public Works was put in charge of the construction. The designers created plans for a gothic-style suspension bridge, which quickly gained a reputation as one of the most celebrated suspension bridges in the Northeast. On August 25, 1930, cars drove across the bridge for the first time. In 1994, the bridge was rechristened the Franklin D. Roosevelt Mid-Hudson Bridge. Multiple upgrades have been made to the bridge over the years. An EZ Pass system was added in 1999, which significantly cut down on bridge traffic. A pedestrian walkway was added in 2000, and necklace lighting was installed on the bridge in 2001. Repainting, maintenance scraping, metalwork repairs, and lead paint abatement have also been performed periodically. Scaffold Resource has made upkeep on the bridge possible. We furnished and installed a scaffolding and containment structure for the top of the 260 feet tall suspension tower over active traffic. The scaffolding was designed to stand up to wind gusts of up to 100 miles an hour to ensure the safety of the workers and traffic below. At Scaffold Resource, we can create and manage scaffolding and shoring for everything from simple jobs to complex work on historical structures. Get more information about our project management and scaffold rentals in Washington, D.C., by calling (301) 924-7223.